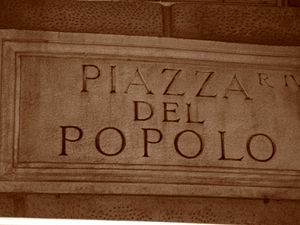 Piazza del Popolo is one of my favorite pedestrian-only squares in Rome because it offers so many interesting sites and things to do. 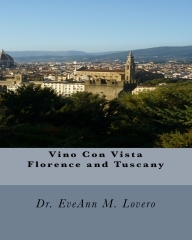 The Piazza is situated between the ancient Porta Flaminia and the park of the Pincio. 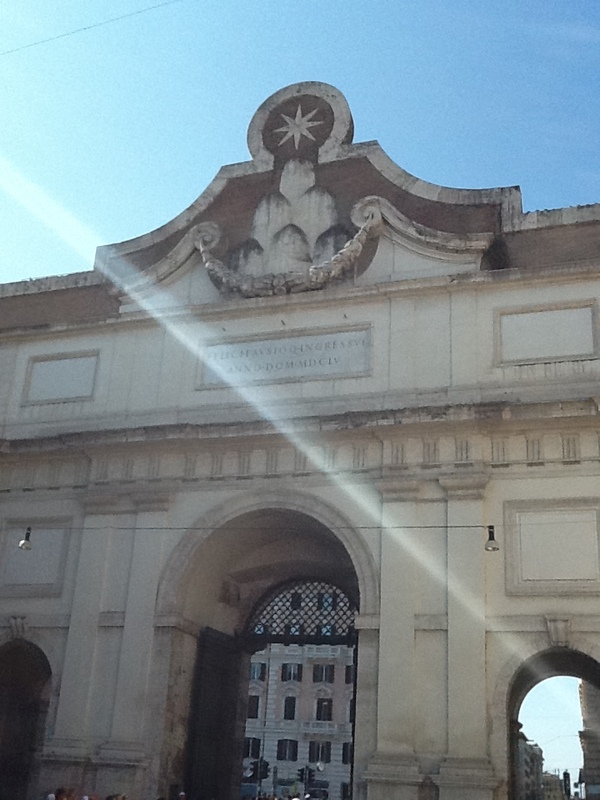 The Porta Flaminia was one of the gates in the ancient Roman Aurelian Wall. 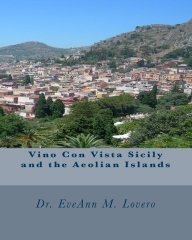 It was the starting point of the Via Flaminia which led north to the Roman town of Ariminum ( Rimini) in Ancient Rome. 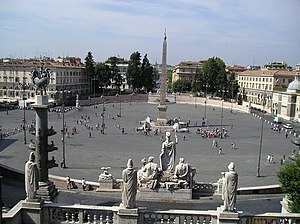 On the north end of the piazza stands the Porta del Popolo that is also called the Porta Flaminia. 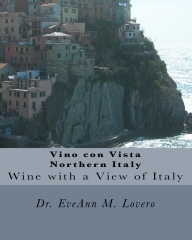 It leads to the the Piazzale Flaminio and the start of the Via Flaminia. 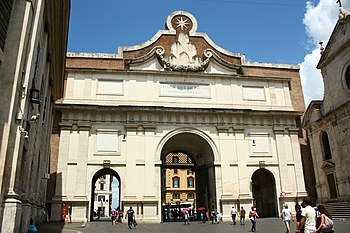 The gateway was reconfigureed by Bernini for Pope Alexander VII in 1655, to welcome Queen Christina of Sweden to Rome following her conversion to Roman Catholicism after her abdication. The Piazza has a suberb location in Rome. The central street, the Via del Corso follows southward to the Piazza Venezia, the Capitol and the forum. 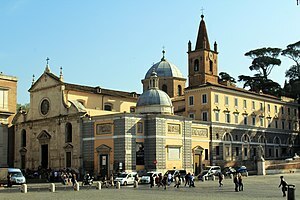 The Via di Ripetta leads past the Mausoleum of Augustus to the River Tiber and the Via del Babuino (“Baboon”) leads to Piazza di Spagna. The Piazza has one of the tallest obelisks in Rome surrounded by outdoor cafes perfectly suited to an extraordinary Vino con Vista. 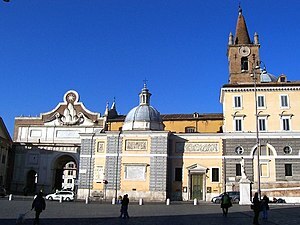 There are three churches in the square: The Church of Santa Maria del Popolo with a simple facade and the twin Baroque churches of Santa Maria dei Miracoli (1681) and Santa Maria in Montesanto (1679). 1. 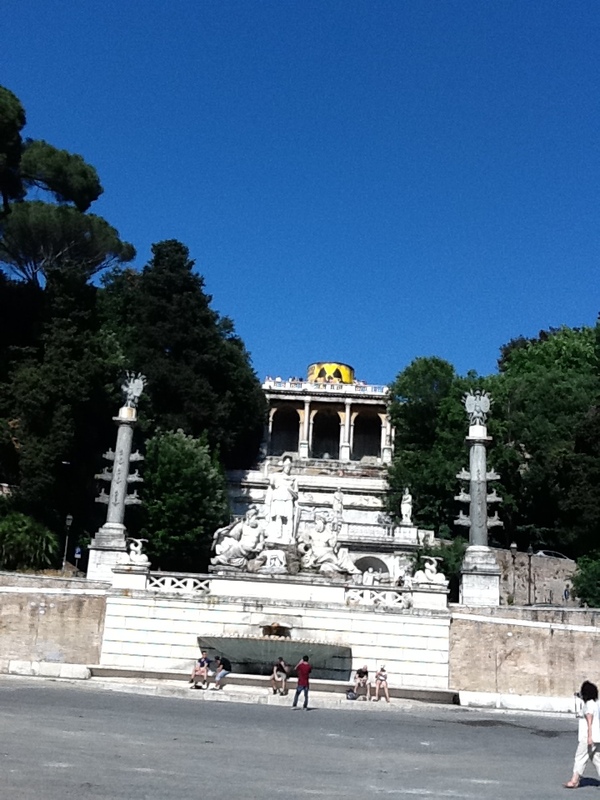 From Piazza del Popolo you can climb the stairs behind the Neptune fountain to the top of the Pincio Steps that lead from the Piazza del Popolo to the Villa Borghese’s gardens. 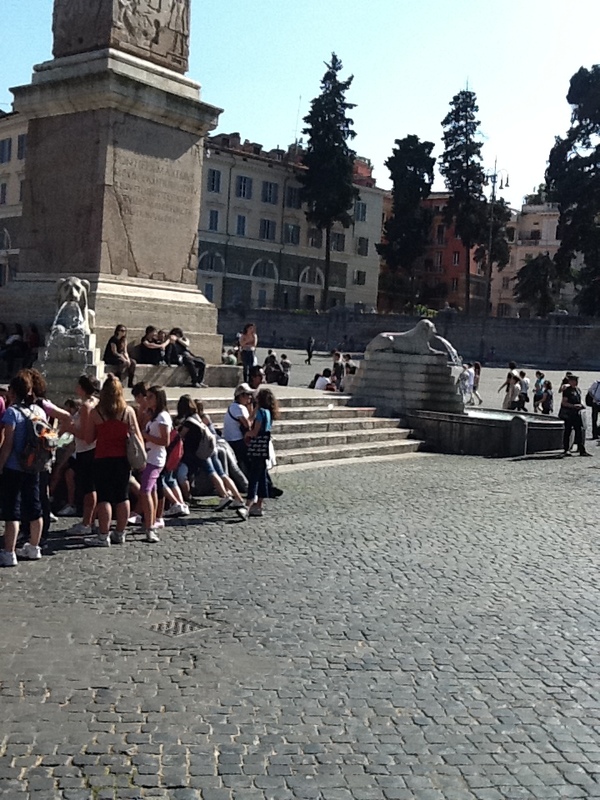 The stairs link the piazza with the heights of the ancient Roman Pincian Hill that overlooks the space from the east. The pedestrian steps leading up beside a waterfall to the Pincio park balustraded lookout that provides a passageway to the Villa Borghese gardens. 2. The Popolo Obelisk is the Egyptian obelisk of Sety I from Heliopolis. Three sides of the obelisk were carved during the reign of Sety I and the fourth side was carved during the riegn of Rameses II. 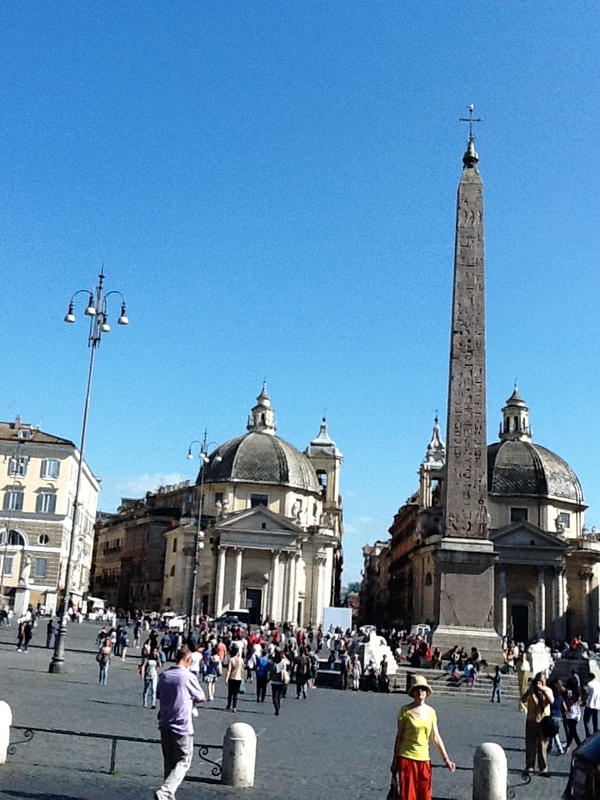 The obelisk is also called “obelisco Flaminio” and it is the second oldest and one of the tallest obelisks in Rome. 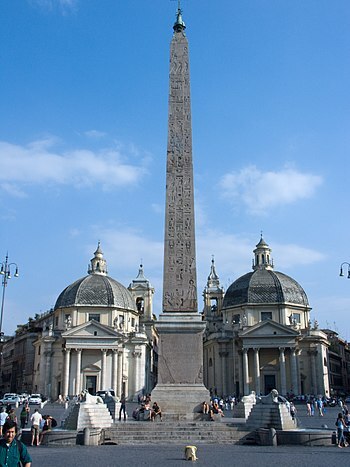 The obelisk was brought to Rome in 10 BC by order of Augustus and originally set up in the Circus Maximus. It was re-erected here in the piazza by the architect-engineer Domenico Fontana in 1589 as part of the urban plan of Sixtus V.
At the center of the piazza is the Fontana dell’ Obelisco with a group of our mini lion fountains. Each lion is situated on a stepped plinth added around the base of the obelisk in 1818. The layout of the piazza today was designed in neoclassical style between 1811 and 1822 by the architect Giuseppe Valadier when he removed a modest fountain by Giacomo Della Porta that was erected in 1572. 3. 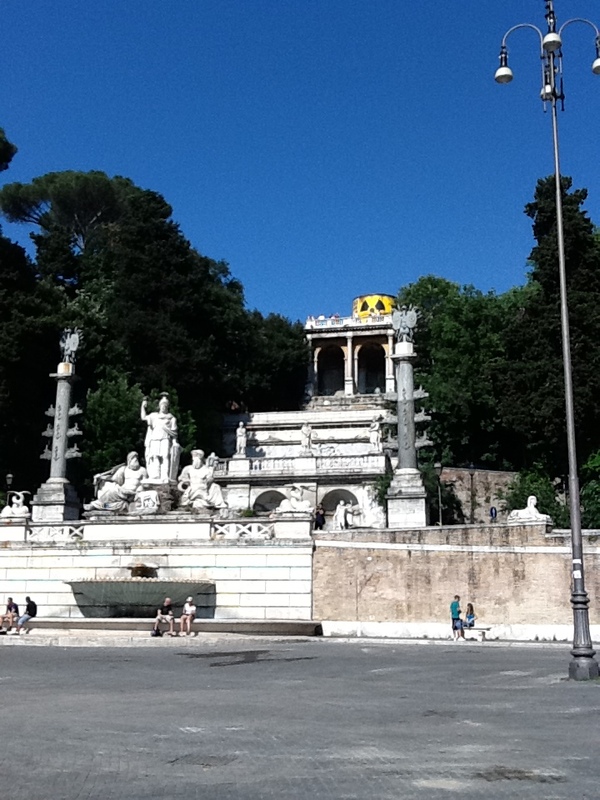 The Piazza has a lovely Fontana del Nettuno at the base of the Porta del Popolo on Pincio Hill. 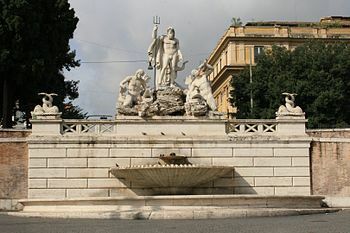 The Piazza Popolo Fountain of Neptune stands on the west side of the piazza and depicts Neptune with his trident accompanied by two dolphins. 4. Visit the symmetrical (almost) twin Baroque churches of Santa Maria dei Miracoli (1681) and Santa Maria in Montesanto (1679), begun by Carlo Rainaldi and completed by Bernini and Carlo Fontana. These churches define the junctions of the roads called the “trident” (il Tridente): the Via del Corso in the centre; the Via del Babuino to the left (opened in 1525 as the Via Paolina) and the Via di Ripetta (opened by Leo X in 1518 as the Via Leonina) to the right. 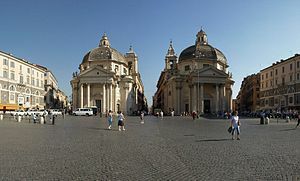 The two, almost twin, churches of S. Maria di Montesanto (left) and S. Maria dei Miracoli (right) in Piazza del Popolo were designed by Carlo Rainaldi. 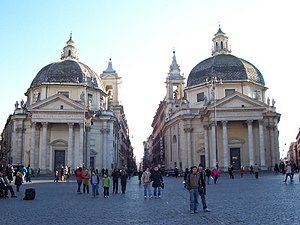 Gian Lorenzo Bernini provided him with advice on how to emphasize the similarity between the two churches. 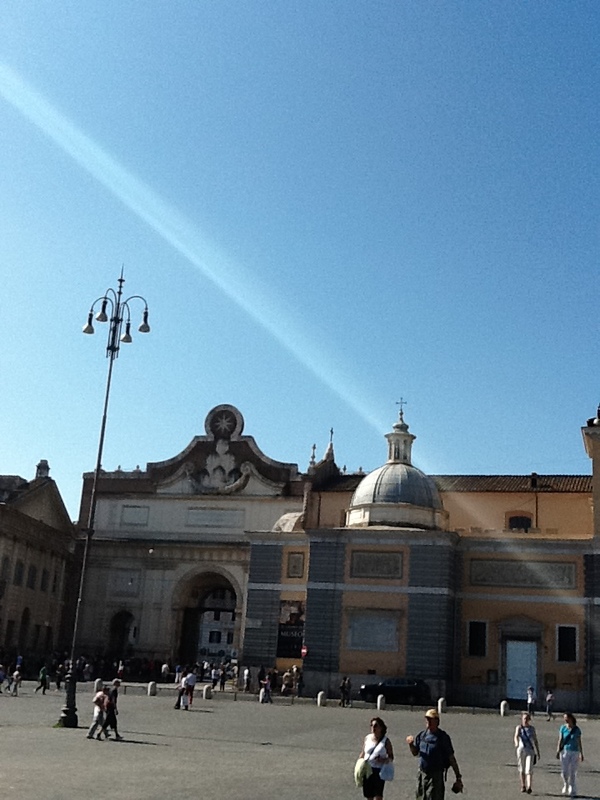 S. Maria di Montesanto was erected first (1678) and S. Maria dei Miracoli a few years later (1681). The columns come from the bell tower erected by Bernini for St Peter’s, a project that was eventually abandoned. 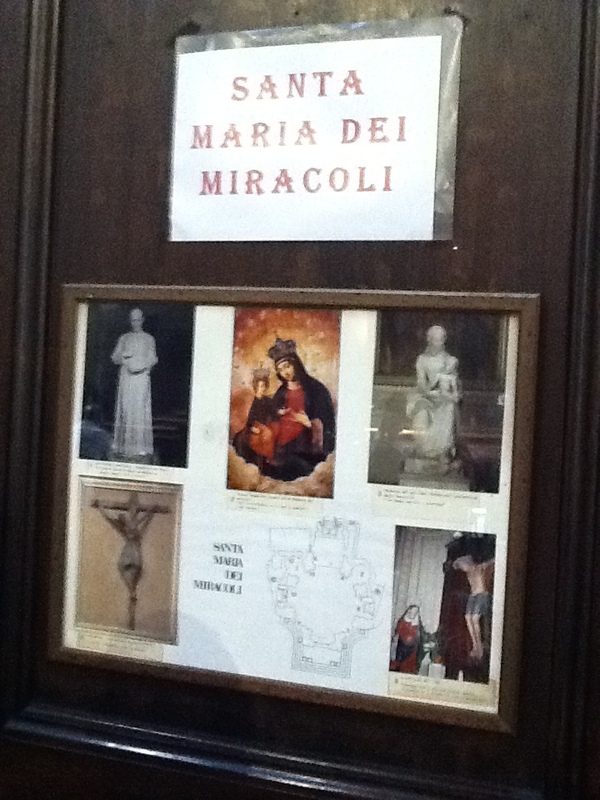 The high altar of Santa Maria dei Miracoli has the miraculous image of the Virgin which has given the church its name, “Madonna dei Miracoli” (Our Lady of Miracles). The first chapel on the right-hand side has an altar dedicated to Our Lady of Bétharram, named after a shrine near Lourdes. The church was erected by C.Rainaldi to preserve an image of the Madonna that was found on the wall close to Porta del Popolo. The church has two chapels on each side. The image of the Madonna is on the high altar surmounted by four marble angels by A.Raggi. In the presbytery, there are funeral monument to cardinal Gastaldi, who sponsored construction of the church, and his brother. The facade was later changed by G.L.Bernini and C.Fontana. 5. 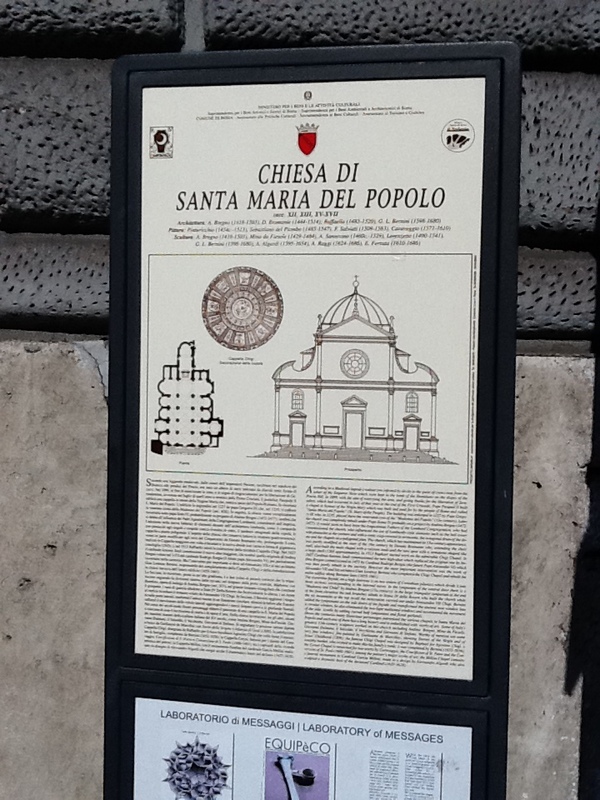 The Church of Santa Maria del Popolo has a simple facade. 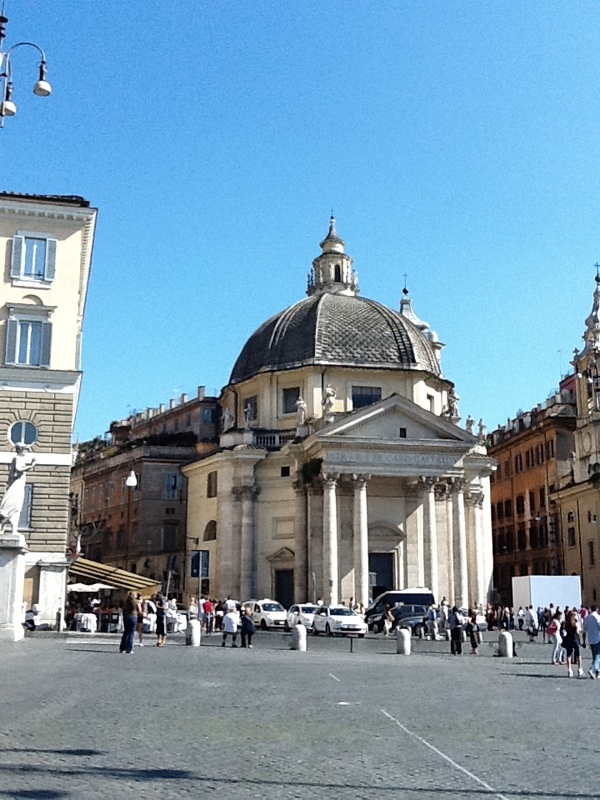 It is an Augustinian church located on the north side of the Piazza del Popolo. It occupies the site where Pope Paschal II (1099-1118) built an oratory over the tombs of the Roman Domitia family at the foot of the Pincian Hills. The church includes works by several famous artists, architects and sculptors including: Raphael, Gian Lorenzo Bernini, Caravaggio, Pinturicchio, Andrea Bregno, Guillaume de Marcillat and Donato Bramante. 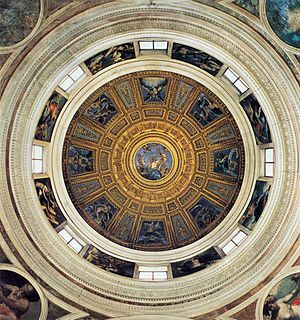 The dome of the Chigi Chapel is decorated with Raphael’s drawings of the Creation of the World. These depict God as creator of the heavens, surrounded by symbols of the planets. The original church was built on this site in 1099. A host of famous architects rebuilt this beautiful old church beginning in 1472; namely, A. Bregno, Pinturicchio, and B. Pontelli. 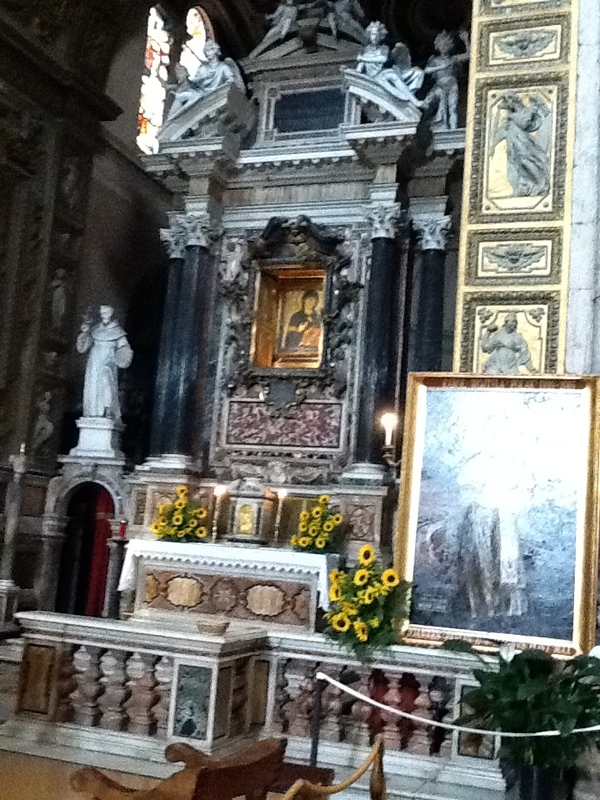 Later, Bramante and Bernini made additions to it. Santa Maria del Popolo contains one of the richest collections of art of all Rome’s churches, with the exception of St. Peter’s. It also contains two Chigi pyramid tombs embedded in the walls of the side chapels, the tomb of Cardinal Foscari, and the tomb of Cardinal Della Revere by Mino da Fiesole and A. Bregno. 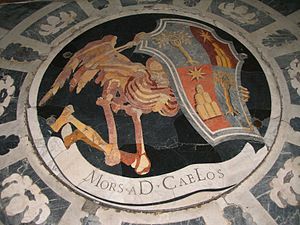 There is a the kneeling skeleton mosaic on the floor in the Chigi Chapel of the 17th century. It represents the coat of arms of the House of Chigi. Visit the gorgeous Della Revere Chapel and be sure to admire the stained-glass of 1509 by French artist Guillaume de Marcillat. Also, there is the tomb of Ascanio Sforza, who died in 1505, built by Andrea Sansovino. 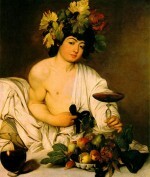 Nero lived on in the imagination of the people long after the fall of the Roman Empire. In the Middle Ages, a legend arose that a walnut tree growing here on the spot where his ashes were buried was haunted by the Emperor. Ravens roosting in the tree were thought to be demons tormenting him for his hideous crimes. When the first church was built here, under Pope Paschal II’s reign, the tree was cut down, supposedly putting an end to the supernatural events that had terrified the locals for so long. The apse was designed by Bramante. The oldest stained glass window in Rome can be found here, made by French artist Guillaume de Marcillat. Pinturicchio decorated the vault with frescoes, including the Coronation of the Virgin. The tombs of Cardinals Ascanio Sforza and Girolamo Basso della Rovere, both made by Andrea Sansovino, can also be found in the apse. 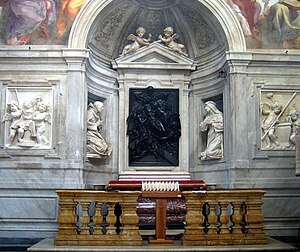 The Cerasi Chapel is one of five chapels located within the Church of Santa Maria del Popolo in Rome. 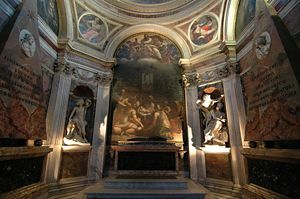 The Chapel contains important paintings by Michelangelo Merisi da Caravaggio and Annibale Carracci, two of the founders of Baroque art. 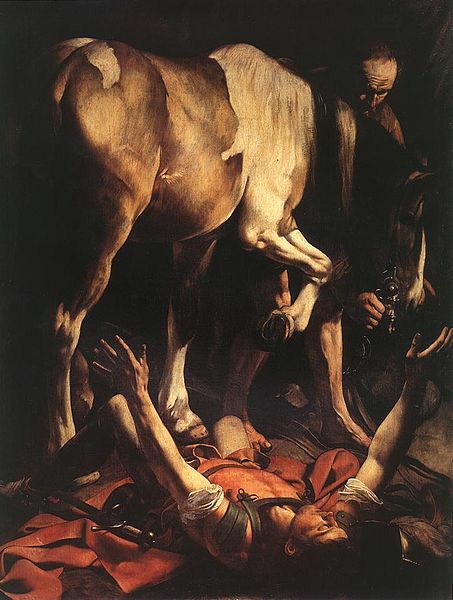 Admire the two famous canvases painted by Caravaggio: “The Martyrdom and Crucifixion of St. Peter” (St. Peter was crucified upside down) on the right side of the Chapel and “Conversion of Saint Paul on the Way to Damascus” on the left side of the chapel. 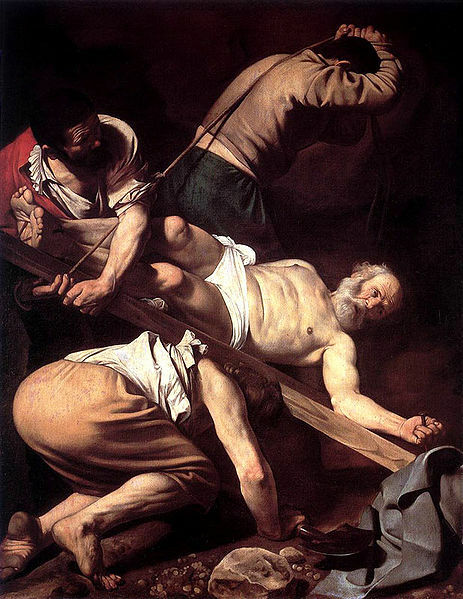 These paintings were commissioned by Tiberio Cerasi in 1600. Situated between the two works of Caravaggio is the altarpiece Assumption of the Virgin by Annibale Carracci. 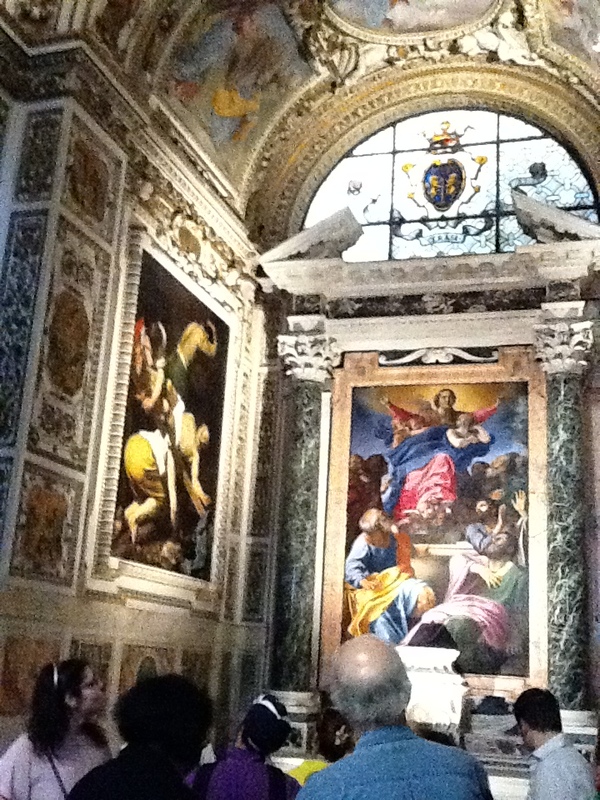 The Chigi Chapel is the most lavishly decorated. The wealthy Sienese banker Agostini Chigi commissioned Raphael to design and decorate the octagonal funerary chapel. On the altar, admire the “Nativity of the Virgin” by Sebastiano del Piombo. God the creator of the heavens is surrounded by the symbols of the planets guided by angels. 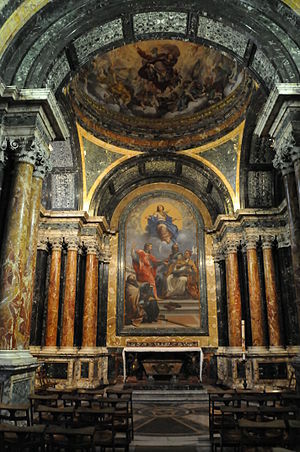 Gian Lorenzo Bernini would later complete the chapel. His additions include the sculptures “Habakkuk and the Angel” (1655-1661) and “Daniel and the Lion” ((1655-1657). 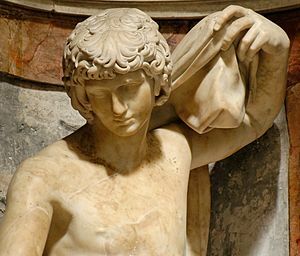 Bernini also created the portraits on the tombs of Agostino and Sigismondo Chigi on the sides of the chapel. 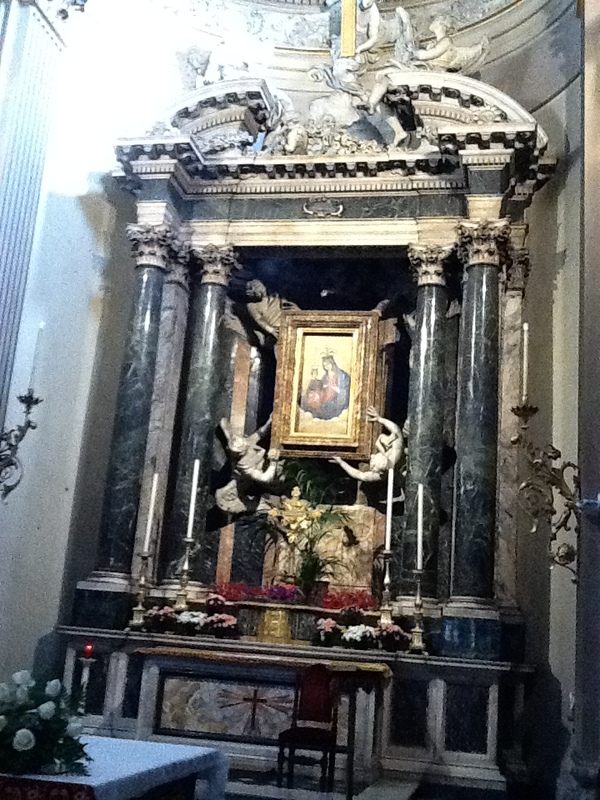 The main altar has as image of the Virgin. Below the 13th century image of the Virgin it says: “You are the honor of our people.” There are two statues of Augustinian saints on either side of the picture of the Virgin: Nicholas of Tolentino on the left and William of Maleval on the right. The Della Rovere Chapel has a beautiful fresco by Pinturicchio depicting the Nativity and the life of St. Jerome. On the sides of the chapel are the twin tombs of the Cybo Cardinals; Lorenzo on the left and Alderano on the right. 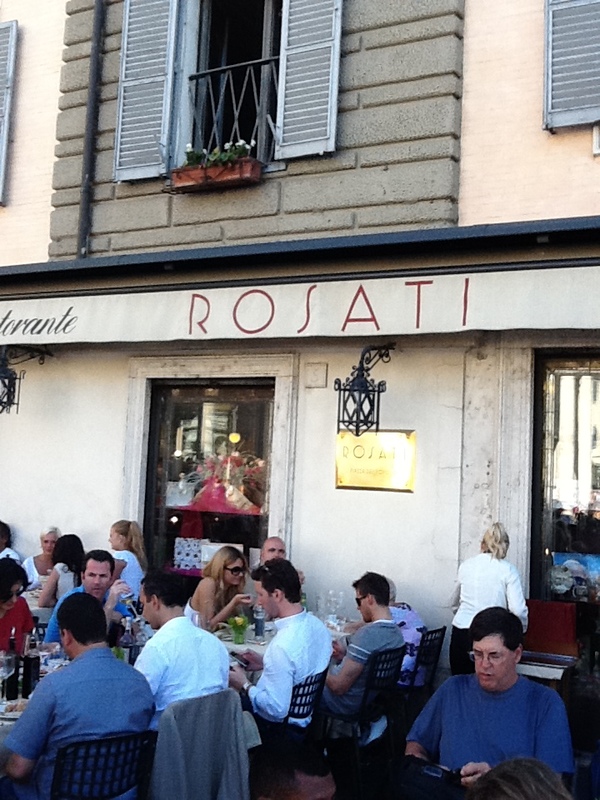 At the end of your site-seeing adventure, have a Vino con Vista at the Rosati Cafe. 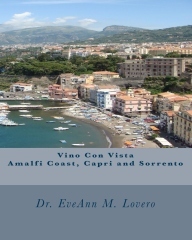 Dr. EveAnn Lovero writes Italy Travel Guides. 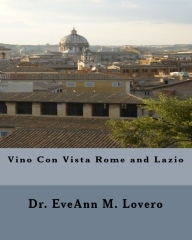 To learn more about Rome visit www.vino-con-vista.com.